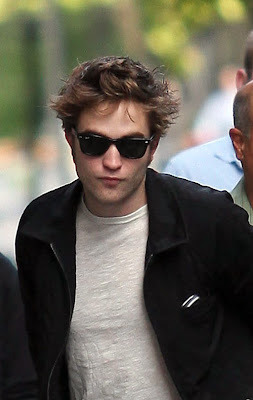 After being chased yesterday Robert Pattinson arrived to the set of Remember Me less jovial but focused. Now I know some people think the swarm of fans was OK and think it was cute to be so zealous. But let me tell you it was just plain WRONG!! I saw this post on Celebrity Gossip I was simply floored. Wish he'd shoot a movie here in soCal. Ha, you're not the only one that needs to step off! LOL! The guy will end up being a recluse with rabid fans like that. Get a grip! 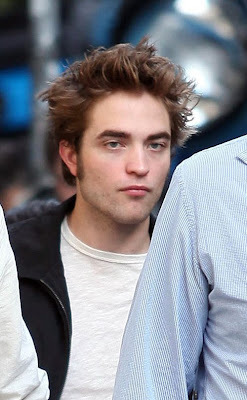 I dont blame him for seeming less than thrilled to be on set today after all the chaos yesterday. Saw the pic of him sitting with his head between his legs just chilling...poor bb. It makes me sad and I do think he will become a recluse. 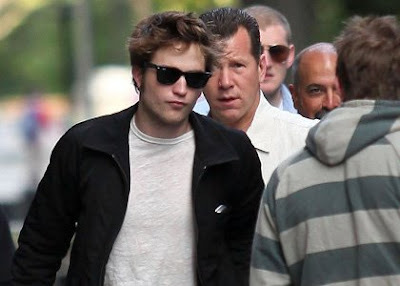 How miserable for Rob to go to work for the fans and they attack him? What's with that? If anything happens to him I will grieve for him, how about you skanks?